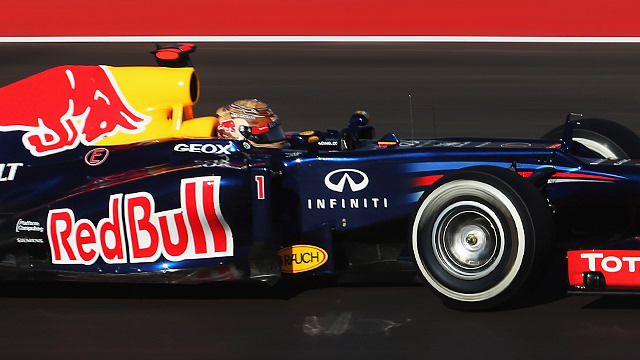 This is F1Minute - Red Bull pip McLaren to US Grand Prix pole. The HRT team had already aired their concerns about making it inside the 107% cutoff in qualifying for the United States Grand Prix, but they needn’t have worried. Even with Narain Karthikeyan pulling to a halt during the first session, they still managed to keep inside the required time and qualified for the race. In Q2, Jenson Button reported a loss of power over the radio, and subsequently crawled back to the pitlane. He still managed to qualify twelfth despite taking very little part in the session. Behind him, Nico Rosberg was seriously struggling for pace, qualifying 17th whilst teammate Michael Schumacher made it into the top ten. The final session saw Schumacher qualify sixth, not bad at all. Behind him, Massa was 7th with Alonso down in 9th. Ahead, it was Sebastian Vettel who took pole position just a tenth ahead of Lewis Hamilton, who in turn was ahead of Mark Webber. Romain Grosjean qualified fourth but takes a five place gearbox related grid drop.